You know an auction is good when the Ferrari F40 isn’t even the most interesting thing for sale. This auction is for the cars of Team Taisan, a longtime privateer racing team in Japan—best called an institution, really. It started running Porsche Group C cars in the early 1980s, it has a GT3 class win at Le Mans, and has been in Super GT for years. 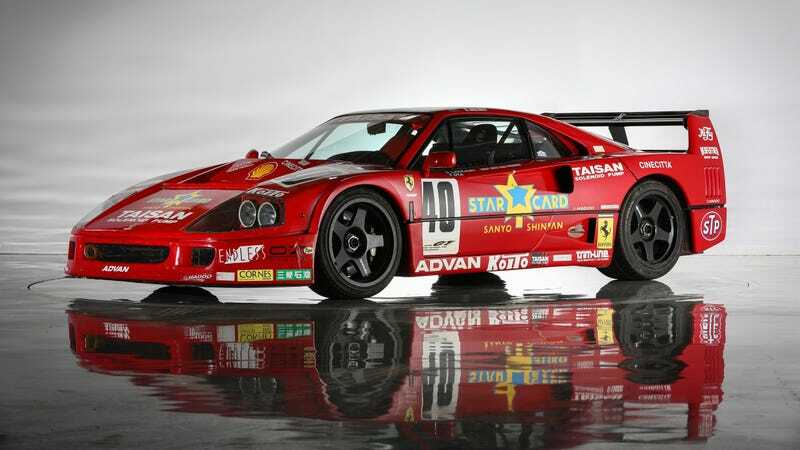 And if you of the time when Ferrari F40s raced in GT1, back in the 1990s, you may be thinking of a Team Taisan car. Yasutsune “Ricky” Chiba ran this red #40 car back in 1994. Recently it has been mounted to his ceiling. Now it could be yours for... an unknown price. Should you be the one to nab this race-winning ceiling car, you can also scoop up a spare engine. Price is also unlisted. A 996-generation Porsche 911 GT3-R that raced in Super GT in 2007, and a bunch of other interesting cars and parts. He’s best known as the Drift King, but Tsuchiya has a lot of endurance racing under his belt, taking a class win at the 24 Hours of Le Mans in an NSX in 1995 and nearly taking the overall win in 1999 with the Toyota GT-One. For sale here is Team Taisan’s first Godzilla, not the winningest GT-R (it placed second in the championship that year behind another GT-R) but one of the most iconic. People lose their minds for these old Advan looks. This is the real deal period piece. I can’t get over this auction, selling the real history that so many of this Radwood generation is currently remembering and recreating in tribute cars. Again, find all the listings for cars and parts here.